Escape from your daily worries to this remote 2-bedroom, 1.5-bath vacation rental mobile home. This property is the perfect place for a family of 4 to spend their days exploring the waters of Pickwick Lake, a short stroll away, and their nights sharing stories inside this lovely lake house's updated interior. The home is situated only 34 minutes from Florence's vibrant and rich cultural history, and less than half a mile from a well-maintained boat launching area at the Waterloo Boat Ramp! This cozy mobile home has everything necessary for your upcoming Alabama retreat, nestled only a short distance from shores of Pickwick Lake. Picture yourself enjoying a delicious dinner accompanied by a refreshing cocktail in the 4 season patio, gazing out at the gorgeous Alabama sunset slowly creeping below the treeline. 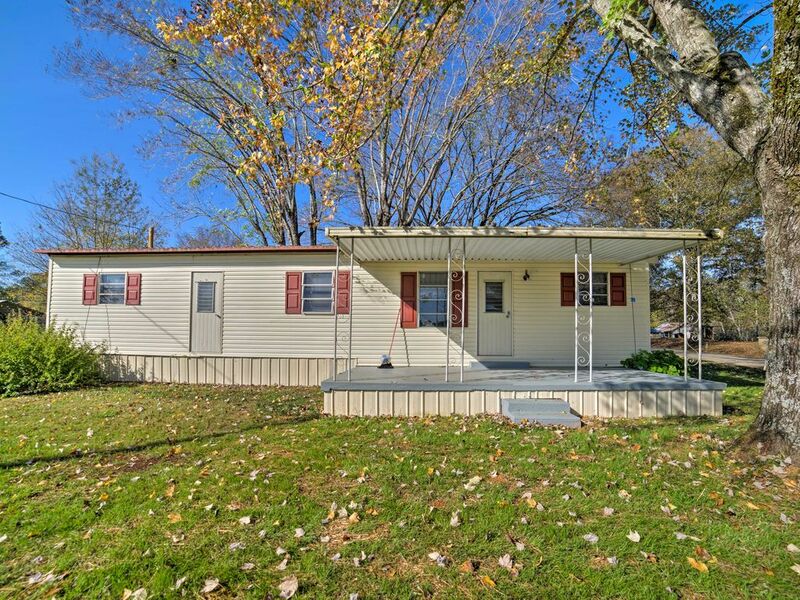 This newly remodeled Lauderdale County mobile home boasts a gorgeous, recently updated interior that's filled with hardwood floors and all new furnishings for you and your guests to enjoy. Start your day by enjoying a morning cup of coffee at the 3-person dining room table in the kitchen. Be the hero of everyone's afternoon by preparing a hearty lunch for the group in the fully equipped kitchen outfitted with a 4-burner electric stovetop, microwave, toaster, and wooden cabinetry! Following lunch, walk down to the pier to watch for wildlife at the bank of Pickwick Lake's tranquil waters. After a successful day of fishing, there is no better experience than grilling up your fresh catch of the day on the charcoal grill. Gather your group for a family style meal at one of the 2 picnic tables by the boat dock and get lost in conversation as you enjoy your dinner! Finish off your adventure-filled day by making a roaring fire and enjoying campfire s'mores with everyone under the Alabama stars! Head out to explore some local Alabama eateries on the nights that you're not grilling at the property. The Southern Farm Table Restaurant and Bakery is 22 minutes away and serves up delicious entrees like fried chicken and catfish accompanied by mouthwatering homemade pies, but be sure to visit on times that they're open! The Waterloo Boat Ramp is a half mile from this mobile home and is the perfect place for launching your private boat into Pickwick Lake for water sports - not to mention it has some of the best smallmouth bass fishing in all of the country! You’ll also be near the Lauderdale Wildlife Management area, which offers over 720,000 acres of land for seasonal hunting, so don’t forget your permits! History buffs need to walk 12 minutes to the Trail of Tears memorial site along the banks of the Tennessee River for a moving and important piece of this nation's history. The Waterloo City Park is a 10-minute walk from the house and is the perfect place to set for a picnic with your group. This home is a 34-minute drive from Florence which is a cultural hub of Alabama rich with famous musical landmarks, delicious local eateries, and a variety of annual fishing competitions! Muscle Shoals Sound Studio is one of the most famous recording venues of all time having hosted some of the biggest names in music ranging from Bob Dylan to the Rolling Stones and is only a short drive away! - Amenities include a fully equipped kitchen, four season patio, 1 flat-screen Smart TV with Roku streaming, outdoor dining area, boat dock, fire pit, free WiFi, charcoal grill upon request, driveway parking, and much more! - Fantastic Waterloo location located close to the city center - a 34-minute drive to Florence, walking distance to the Trail of Tears Memorial Walk and the Waterloo City Park, 0.5 mile from Waterloo Boat Ramp, and close to a variety of delicious local restaurants & cafes! - The number of people listed on the reservation must to reflect the number of people staying at the property. If people exceed the reservation limit guest will be charged $20 per person per night. It’s misleading we were expecting to be on the water. We were surrounded by houses. Never found a pier to fish off of. The owner Beth Ray was very attentive & helpful. Our stay was great, the neighborhood was very pleasant & friendly. One of the neighbors shared some homegrown tomatoes, and they were delicious. There were a lot of extras the owner provided that usually aren't included. And the offering of shopping and delivery within reason was great. We went to May's Cafe and ate lunch food was good and fast service was great and pleasant. The property was well maintained. We loved the screened in back porch. We used the grill, there were cedar chips provided and fluid. We sit on the front porch in the mornings and the view of the sunrise was breathing. You could see Pickwick lake from the property and we had a blast fishing. We have a Harley and ride but this year we weren't able to ride in the trail of tears, because of my husband's health so it was a wonderful surprise for him. I planned this about 4 months in advance. We meet some very nice people at the Trail Of Tears. Eagle's Point and Waterloo Park are a couple of interest to check out too. The directions took us right to the property. The property was cozy and all the comforts of home. Yes, we would recommend this property it's a great place. You can take mornings walks as we did. We have not had a vacation in over 21 years due to my husband health and this property was the right place for us. Thank you for a wonderful stay we will be back. Mike & Sheiliah McGaughy. Ok one more thing I am a Cherokee Indian and really enjoyed watching the Indian ceremonies and dances. We also walked the Trails of Tears and received a free Trails of Tears T- shirts.